You must make reservations at least 5 minutes in advance of the time at Avec Nous. The Pavilion Private Dining Room for up to 20 guests. Garden Suites for up to 40 each. The L’Ermitage Suite for up to 50 and star gazing events for up to 450 on our roof with 360 degree views of the Hollywood Hills, Downtown LA and Beverly Hills. 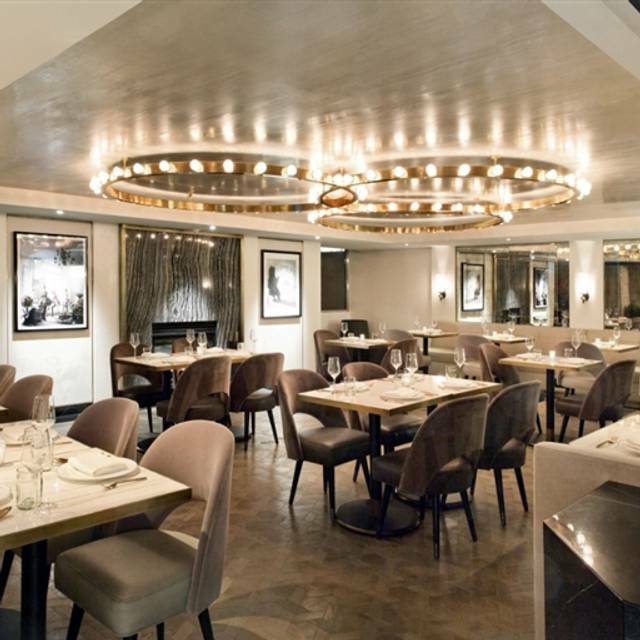 AVEC NOUS is a contemporary take on the classic French bistro; a hip St. Tropez vibe that delivers a fresh culinary experience to Beverly Hills. With inspiration emanating from the Mediterranean coast, Spanish and Italian touches compliment this Riviera feel. European spices accompany locally sourced seasonal ingredients to offer a casual yet refined dining experience. Guests will enjoy tableside service paired with a world-class wine selection. Every visit is elevated through thoughtful and discreet touches to create a lasting impression. The core of AVEC NOUS (WITH US) resonates throughout every moment of a guest’s experience; dine with us, drink with us, celebrate with us. Bonjour nous sommes 2 françaises à avyete dîné au restaurant. Le service état impeccable. Le menu choisi excellent. Je recommande vivement. The evening was a delight and the service was professional and very friendly. True 5 star. Freedman's at Avec Nous was a blast, hope you bring them to the west side again!! We were at the pop up -- though, Friedman's and that was amazing. During a kitchen remodel, we became regulars at Avec Nous. 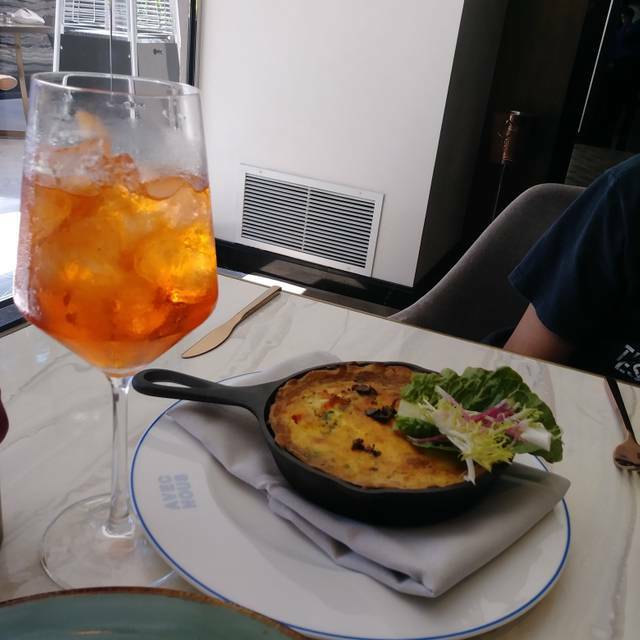 We tried a lot of the menu items, including the lamb rack, coq au vin, salmon, flatbreads, organic romaine salad, daily soups and were never disappointed. The lamb rack came perfectly cooked at the ordered medium temperature every time. There is a very tasty cocktail, designed by great bartender Blake called Au Pear. Everyone on the staff has been great, including servers Joe and Shea and front desk hostess Dasha. Even though our remodeling is now finished, we expect to continue to be regulars. Our server, Joe, was amazing! Very polite, knowledgeable, you can tell he actually cares for what he's doing without being overly chatty. The food was great! And the wines were top notch! The portions are typical to a French restaurant, so don't expect the usual American amount of food on the plate. 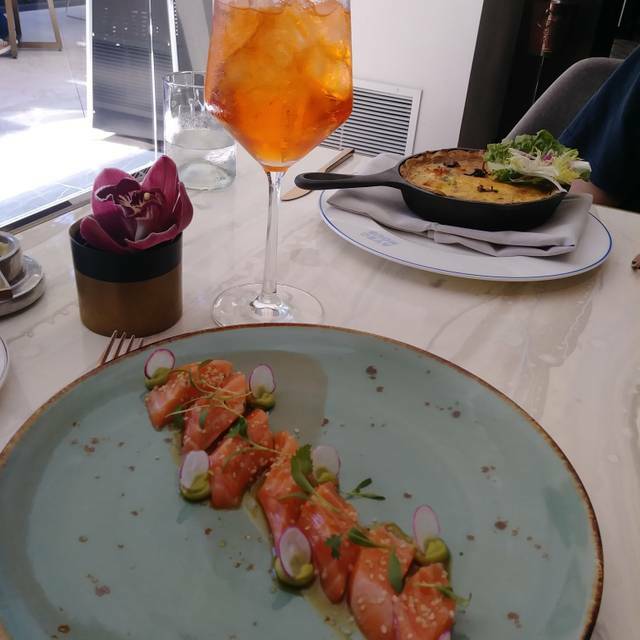 We ordered a shared cured salmon appetizer and each had a DineLA menu, and we both left pleasantly fool. Can't wait to go back! Had the lunch prix fixe which included a light salad to start and wonderful fish for the entree. Supreme experience. Immaculate attention to details. Delicious food. Service was opulent. Can’t wait to go back! The dishes were well crafted, Plating was beautiful. The servers are nice, but under trained. When the first waiter came to get our order, rather than asking if we want a drink first, he just waited for us to say something first. My boyfriend and I were both confused, so just asked a question to break the awkwardness and ordered. When the soup came for appetizer, the waiter forgot to give us spoons. Mind you, this was on Christmas Day when it was a prefix menu--they shouldn't have forgotten a spoon. We tried to grab the waiters' attentions but our seat was too far away that even when we waved no one could see us (also right next to the exit even though there were plenty of other seats available. I was seated here LAST time I came as well for lunch, and also very empty that time as well. I made reservations for both occasions). Some waiters were great, but unfortunately didn't get to interact with the nice ones as much. The food was good but because of the empty ambiance and unprofessional servers, I wasn't able to have the best dining experience. I felt the same way at my first visit, but thought I'd give it another try on Christmas because all the other places were booked for the time I wanted. I wouldn't come again for a third time. Horrible service didn't have a waiter even come to check in on us on Xmas dinner. The hostess was rude and couldn't accommodate me and my GF to a booth even though the place was empty. The appetizer was disgusting just a poor dining experience. The fact that we were the only party of six is baffling that the server was terrible inattentive to us. I had to request water, more than once. Our guests had to ask for bread. I had to ask for pretty much everything instead of him checking in to see if there was something we needed!! 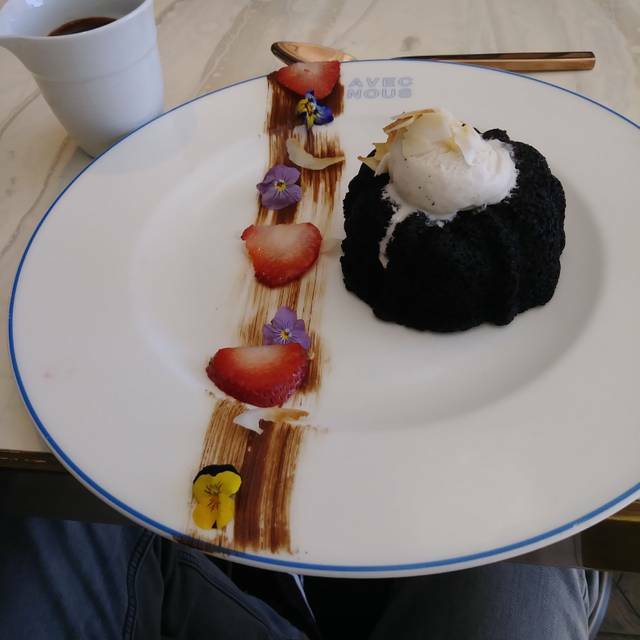 The dessert was as would be expectedly tasty and enjoyable, though nothing to overrate about and when it finally arrived almost a half hour later and we were ‘sharing’’x he didn’t even bring plates!! Just terrible service. All the guests finally arrived by 1:30 for our 1:00 reservation, and we finished and out of there at almost 4:00! I don’t see this place lasting very long!! I’m almost sorry I took my staff there for our holiday luncheon. We had a great time and a great dinner! The food was really food and the service was excellent. We plan on taking friends back for a nice dinner over the holidays! We enjoyed the food, ambiance, QUIET and service. We definitely plan to go back. 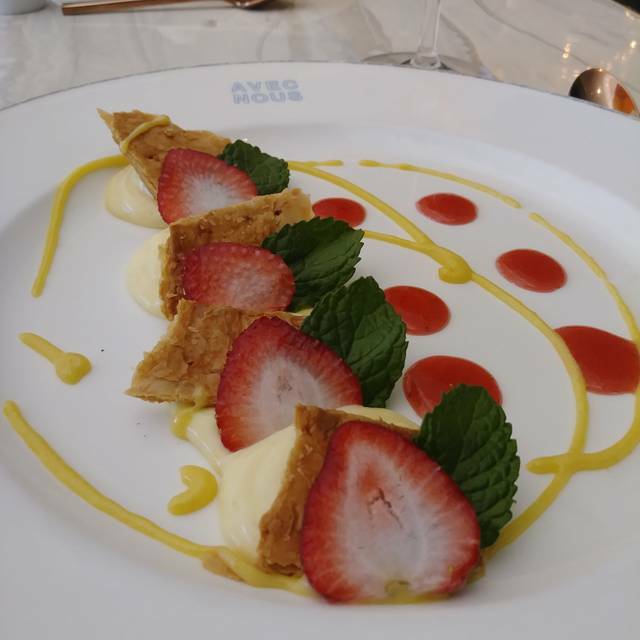 Since French cuisine restaurants are becoming rarer in the city after the closure of some classic, like Bouchon and le Petit Bistro, we had to try Avec Nous. The reviews were / are all over the place, terrible or terrific. So, overdue for a first-hand check. First, the wine list is great. That’s half of the battle. The place is / was very quiet. Either a plus or a minus, depending how loud you like to talk. Last, and it should be first, the food: it is good, if not very good. The menu is limited but has some classic. The dessert, a gigantic Paris-Brest, is a cause for return. The service, object of bad reviews, was very good, attentive but not pressing. Overall, it should be more popular than it is but, as part of a hotel in a residential neighborhood, it has to struggle that setting. Awesome service with thanks to Brad, Dasha and Jen. We enjoyed the lovely duck trio which consisted of duck leg confit, crispy tender duck breast and silky duck mousse. Our octopus appetizer was tender and well seasoned and for desert the apple tart was warm and delicious with flaky pastry. Overall the best meal that we had on our weekend at Beverly Hills. We will visit again! The menu was quite good.. a few things to try. The black apricot bread was divine. Salmon Belly Crudo with passion fruit and avocado cream & Lobster Truffle quiche. Salmon was a too warm for raw fish. Passion fruit sauce a nice addition with micro radish and cilantro. Crust on the quiche was definetely over done..gave it an unwelcome bitterness. No truffle flavor within the quiche apart from the egg. Lobster pieces were small and very dry.Truffle pieces were scattered on the top.Would order neither again. Got the orange Milefuille..it came deconstructed. Way too much mint. Orange cream was nice. Chocolate gnache was good. Candy bar a real 'rip off' $5 for 8 gummies & 2 rum chocolates. Our service was excellent. His name was 'J' .and while the food was extremely dissapointing, the service and ambience were excellent. Will try again for dinner in the hope that its better! They forgot our deserts, spent more time on cleaning up on the patio for the next day’s breakfast then serving us dinner inside. This “restaurant” needs to be totally revised. Do not go until they change the management and service policy. And the food wasn’t very good. This is one of the best options in West side Los Angeles. A perfectly prepared salad and grilled salmon were part of the DineLA menu. The dining room is quiet and the lighting bright enough but not too harsh the whole experience was quite French,which was perfect because my friend was just back from Paris. I had Dine L.A. Menu which came with salad for appetizer and salmon for entrée. I could tell vegetable wasn't the freshiest and mustard dressing wasn't a good choice. However, salmon was cooked very well (the skin could have been crispier) and it worked perfect with the grain. I expected the service to be more high-end, however it was more of casual. Servers were nice, but could be trained more professionally. Overall - not bad. But once is enough. Service seemed slow. Drinks took some time as well. The food in general was average at best. I’m not sure if it was because a new menu started this evening. We were underwhelmed. We won’t be back. If you want to know what hospitality really means, then this little secret gem is the place to be. We enjoy being recognized by our first names every time by the entire staff. Always quick to assist us in whatever needs we have but also can quietly stay in the background for privacy. Will always be our spot for a stay in LA/Beverly Hills. The staff was lovely, very polite and pleasant. Some of the items were good, but not worth the price, at all. We ordered the heirloom tomato salad which didn't actually have an heirloom tomato, it was a regular, unripe tomato. The avocado toast with egg was good. At the suggestion of our waitress, we ordered the coq au vin which was awful. Totally dry with tasteless vegetables. The steak frites ($52) was good. The cheeseburger with eggplant was oddly sweet (the eggplant must have been marinated in something). The creme caramel dessert seemed like it came from a tin. A very expensive and disappointing meal. A gem of a place to meet for all occasion. I would highly recommend the restaurant to locals and travelers. Literally the worst dining experience I can recall. Terrible service and the food is disgusting. The sauces taste like water. They definitely leave their good reviews. You’re better off going to McDonald’s. Lovely meal and beautiful quiet dining room. We will be back. Elegant, refined decor yet still feels California casual. Classic French dishes are fresh and modern. Avec Nous is a hidden gem in Beverly Hills. The Easter Brunch was great! Very good food and service at a reasonable price. We have also had several excellent dinners there. The food was good. Heidi, my bartender, was amazing. Would recommend this place. The change in management is obvious, comparing the restaurant now to previous experiences. The management seems more interested in making money off alcohol service to the regulars, than in general service and food quality control efforts. The waiter made us feel very unwelcome and unimportant. 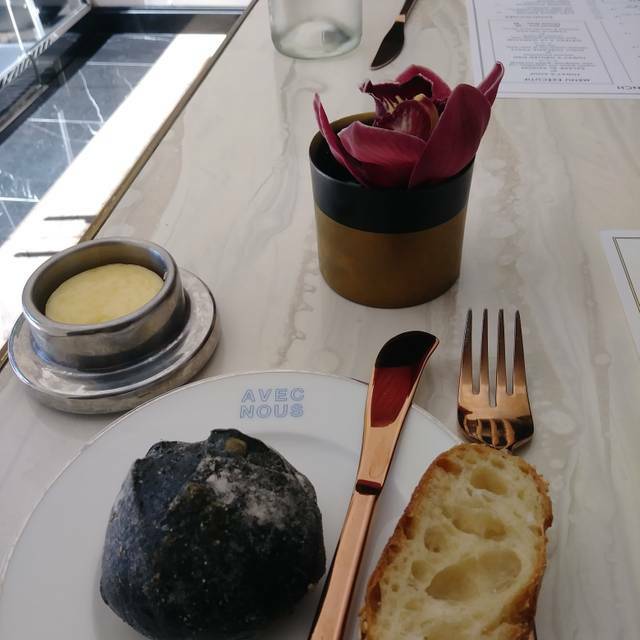 The food and service quality was poor - dry bread, ignored empty water glasses, grey bacon (indicating not enough contact with pan, hurried or inattentive cooking), no asking how things were. Took 15 minutes after we were clearly done to receive the bill or get plates cleared. The whole time manager and waiter were tending alcohol mostly two tables of regulars only, sparse service to all other tables. Alcohol is more profitable than food, and 'regulars' being happy is important, but letting it show in the food and service to this extent is not a sustainable business plan. Just make it a private club if that's the goal. Had planned to be a regular but won't return. I sent my parents for their wedding anniversary. They thought the dining was pretty but nothing special. The restaurant had only 4 tables of people. The service was friendly and attentive as there weren’t many people. The food was good but the foie gras was beyond tiny. For the dessert they brought a “happy birthday” on chocolate instead of anniversary. They aren’t rushing back anytime soon. Notified us two hours in advance of the reservation that the restaurant was closed for filming and seating would be in another location. First and last time here. Service was terrible, food took forever to arrive and was mediocre. And the restaurant was empty, so it wasn't because it was busy. Will not return. Great food, good service, lovely decor, recommended spot. Great customer service! Great food! I come here all the time because it's so close to work, but I love how quiet it is.